Shekra, the first Shariah-compliant Crowdfunding platform globally, receives the Islamic Economy Award as best SME Development provider at the Global Islamic Economy Summit in Dubai. The Islamic Economy Awards is managed under the patronage of His Highness Sheikh Mohammed bin Rashid Al Maktoum, Vice President and Prime Minister of the United Arab Emirates and Ruler of Dubai. These flagship awards for the Global Islamic Economic Summit 2013 celebrate established and emerging companies that have demonstrated significant business and social impact using the Islamic economic ethos, and have inspired a new generation of leaders. The integrity and credibility of the Award was managed independently by Thomson Reuters, the world’s leading information provider; audited by Deloitte, the world’s largest privately-held professional services organization; and adjudicated by an esteemed Judges’ panel based on formal, established criteria. The winners for the Islamic Economy Award 2013 included among others Kiva for best Islamic Microfinance, SEDCO Capital as best Islamic Fund and Shekra Crowdfunding from Egypt for best SME development. 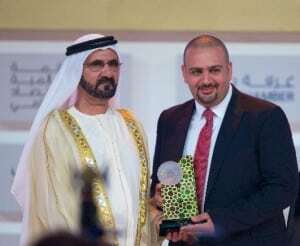 Dr. Shehab Marzban received the Award from HH Sheikh Mohammed Bin Rashid Al Maktoum on behalf of Shekra at the Opening Ceremony of the Global Islamic Economy Summit in Dubai on 25th November, 2013 at Madinat Jumeirah, Dubai, United Arab Emirates. Shekra wins the Ethical Finance Initiative Award 2013 at the Global Islamic Economy Summit in Dubai after being voted for by the delegates attending the summit. Abu Dhabi Islamic Bank and Thomson Reuters partnered to launch the world’s first Ethical Finance Innovation Challenge and Awards (EFICA). The Ethical Finance Initiative Award looks to promote emerging and existing talent by offering a prize of $50,000 for new or existing ethical financial solutions or initiatives that can be implemented within the financial sector. Mr. Adel Boseli and Dr. Shehab Marzban received the award from Tirad Mahmoud, CEO of ADIB, and James Smith, CEO of Thomson Reuters.